2D CAD Converter Tool for fast transformation of polylines or small lines into arcs or longer lines, in addition smoothing of created curves. The number of lines is greatly reduced and the contour quality is improved. 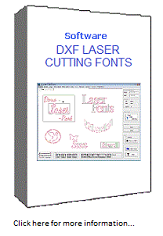 The font tool for laser cutting and other systems with DXF-interface ! Curves are converted in tangential arc and line elements a smooth cut is assured. Spezialsoftware zur schnellen Erstellung von lasertauglichen Schriftzügen, Schildern, Schablonen, Symbolen, Buchstaben und Ziffern aus Windows-Schriften.